Story: Kang-soo (Kim Nam-gil) is an insurance detective who investigates whether the claims of insurance money are legit or merely attempts to defraud. His newest case revolves around a car accident victim that is in a coma. The woman is blind and has been hit by a car which is why Kang-soo's boss wants a settlement with the legal guardian of the woman, whose mother has left her at an orphanage at a young age. Thus, Kang-soo visits her in hospital. There he isn't left alone by the woman Mi-so (Chun Woo-hee). 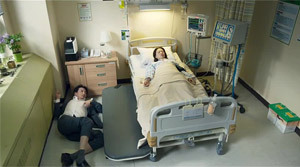 At first, the insurance detective doesn't want to accept that only he can see the woman, but he soon realizes that she is something like the ghost of the woman who is in a coma. Even though Kang-soo doesn't understand what's going on, and Mi-so even less, the two slowly become friends. Kang-soo, who still suffers a lot from his wife's death, finally finds a little bit of fun in life and shows Mi-so the world outside of the hospital walls, which she now sees the first time with her own eyes since she isn't blind as a ghost anymore. Eventually, Kang-soo even decides to track down her mother. Review: When it comes to a drama like "One Day" we instantly believe to know where the trip is heading. Of course it's a hospital drama because the movie takes place at exactly such a location, after all. Then the story also centers around a woman in a coma. So let's just be prepared for a lot of tears. However, then again the movie also manages to surprise. It sometimes feels a bit art-house-like. This means that there is more substance to be found here in the way Kang-soo deals with his suffering than we expect and that there is also more profoundness accordingly. Moreover, the acting is well-achieved all throughout. Ultimately, the movie looks like a well done compromise of art-house cinema and a tearjerker drama for a wider audience. Naturally, you will have to deal with the fact that the supernatural factor is the driving force in the movie. Director Lee Yoon-ki has already proven his skills in the art-house genre with "Ad Lib Night" and with "My Dear Enemy" he also made the transition to mainstream cinema, even though he has stayed true to his handwriting: Shedding light on the drama of individuals and not shying away from taking a look at the more complex aspects of people. In this regard "One Day" doesn't disappoint either. However, you can also make out that the director puts himself into a profile which is forced upon filmmakers by most tearjerkers. For instance, there is a pseudo twist and something like a resolution with an aha effect towards the end. This actually wouldn't have been necessary, but in other respects the filmmaker refrains from clich�s. For example, there is no love story here, even though you might have expected one. To be honest, the relationship between the two protagonists feels just like a love story. But this is because our viewing habits instantly make us think of having a future love couple in front of us. In reality, the plot works at least as good, if not even better, by letting Kang-soo and Mi-so just be friends. The insurance detective suffers from the death of his wife and has lost his will to live. He hasn't any real friends or we don't see them, because he has distanced himself from everyone. It's just the perfect moment for Mi-so to turn up since she suddenly brings more color and vigor into his life. Even though she herself isn't really alive. It may seem a bit hackneyed at first how Kang-soo can't accept the obvious, although also impossible, for a while, but then he just puts up with having a ghost standing in front of him. What other choice does he have since he doesn't get any answers on what Mi-so exactly is. So you shouldn't waste your time questioning how "One Day" wants to explain its supernatural peg. Because even in the end it doesn't. This is probably the smartest way. However, most likely only someone so extraordinary like Mi-so could dissuade the insurance detective to dive even deeper into depression. Kim Nam-gil ("Pandora", "The Shameless") delivers his best performance to date and scores with a believable display of emotions, even in the more subtle moments. At the end he also has to make a difficult decision and here Kang-soo suprises and reveals a lot about his character. When during the finale we get to know more about his wife's death we only start to put his behavior into context and thus it's even worthwhile watching the movie a second time. Chun Woo-hee ("The Piper", "Thread of Lies") stands as the life-affirming counterpart, but also remains subtle and doesn't drift off into the clich� of a sassy love interest. It's the way "One Day" moves along the line of familiar genre conventions without really depicting them which makes it stand out. Many of the outdoor shots, for instance in the small town or at the beach, in fact remind us more of a subtle drama, as does the soundtrack. It's those subtleties that keep us from having to roll our eyes when the inevitable tears start to flow. Under its presumed tearjerker surface there is a good character drama hiding in "One Day" with a nice relationship in the center which finally doesn't just revolve around love. This actually would have been too mundane for a director like Lee Yoon-ki anyway.